Zu�iga Flores, M., Ortega Garc�a, S., Santana Hern�ndez, H. & Rodriguez Jaramillo, M. C. First evidence of pompano dolphin (Coryphaena equiselis) spawning in the Central Mexican Pacific. Pan-American Journal of Aquatic Sciences, 6(4): 260-263. Download PDF file (514 Kb). Gaeta, J. C., Faria J�nior, E., Aguiar, M. M, & Freire, A. S. The use of a non-destructive method to estimate the abundance of brachyuran crabs (Crustacea, Decapoda) in coastal islands of a marine protected area. Pan-American Journal of Aquatic Sciences, 6(4): 264-272. Download PDF file (351 Kb). De los R�os-Escalante, P., Mansilla, A. & Anderson, C. B. The presence of the genus Hyalella (Smith, 1875) in water bodies near Puerto Williams (Cape Horn Biosphere Reserve, 54� S, Chile) (Crustacea, Amphipoda). 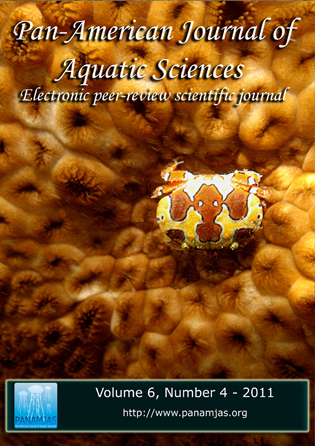 Pan-American Journal of Aquatic Sciences, 6(4): 273-279. Download PDF file (327 Kb). Huergo, J. M., Filgueiras-Souza, R. J., Batista, J. S. & Formiga-Aquino, Q. Molecular genetics as a tool for fisheries management in the Brazilian Amazon: Pira�ba (Brachyplatystoma filamentosum and Brachyplatystoma capapretum) (Siluriformes: Pimelodidae) in white-water rivers. Pan-American Journal of Aquatic Sciences, 6(4): 280-289. Download PDF file (693 Kb). Vilar, C. C., Spach, H. L. & Souza-Concei��o, J. M. Fish assemblage in shallow areas of Ba�a da Babitonga, southern Brazil: structure, spatial and temporal patterns. Pan-American Journal of Aquatic Sciences, 6(4): 303-319. Download PDF file (879 Kb). Militelli, M. I. & Rodrigues, K. A. Morphology of the ovotestis of a hermaphroditic teleost, Serranus auriga (Osteichthyes: Serranidae) . Pan-American Journal of Aquatic Sciences, 6(4): 320-324. Download PDF file (390 Kb). Lodi, L. & Far�as-J�nior, S. Movements of a solitary adult male killer whale, Orcinus orca (Cetacea, Delphinidae), along the coast of south-eastern Brazil. Pan-American Journal of Aquatic Sciences, 6(4): 325-328. Download PDF file (185 Kb).